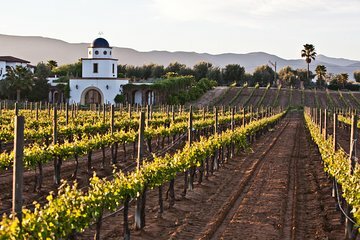 Visit the Mexican wine country of Valle de Guadalupe on this 10-hour tour from San Diego. Located north of Ensenada on the Baja Peninsula, the wine region is gaining acclaim and popularity from those in the know. This tour takes you across the border so you can visit three wineries, taste the wines, enjoy a behind-the-scenes look at winemaking here, stop for a food tasting, and enjoy a hacienda-style lunch overlooking the valley. A guide accompanies you throughout the tour. Travel along a scenic road that leads to the Pacific, and ride along the coast for about 1.5 hours, making a short stop at a lookout point before you arrive in the city of Ensenada. From here, head east into Valle de Guadalupe, Baja's wine country, and visit three wineries (mostly boutique and family-owned) for tastings of the local varietals. At one winery, you'll also take a tour to learn about wine production. Wineries may include El Cielo, Adobe Guadalupe, Baron Blanche, and Hacienda Guadalupe (subject to change). Next, enjoy a gourmet lunch of Baja-style dishes at a winery with views of the grapevines, and then stop at a pasty and cheese shop for tastings. Your tour then ends with the return drive to San Diego.